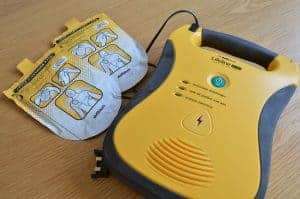 AEDs and businesses come up an awful lot in conversations we have with businesses who we supply first aid training too, one of the biggest misconceptions is that only trained people can use these devices and they are complicated to use, both are myths. It is true that with all workplace first aid training we do teach the first aider how to use an AED because it is a requirement laid down by HSE, but they are NOT complicated to use and if they are complicated why would there be public AEDs in cabinets dotted all around the country for the public to use in an emergency. An AED once activated will guide the user on how to use these devices in simple easy steps and as long as the person using the device follows these simple steps it will do the job it is designed to do and give a shock if the heart has an irregular rhythm to hopefully bring it back into regular rhythm. Some companies believe that if an AED is not successful during CPR they could be liable for loss of life this is also a myth after all having a cardiac arrest can happen anywhere and if one does occur where an AED is available then the survival rate increases whereas not having one available the survival rate is significantly lower as time passes by. Another myth about AEDs and businesses is that it will increase their business insurance premium in the majority of cases this is untrue, many business owners openly admit that they feel they are between a rock and a hard place when deciding to introduce AEDs into the workplace because if the AED was unsuccessful during resuscitation they would be liable for loss of life. Using an AED during the resuscitation cycle is helpful because it will monitor the heartbeat and will only advise a shock if it is required, meanwhile the process of CPR is still continuing till either the person cannot carry on no more or the ambulance service has taken over. Whilst having an AED device in your workplace probably will not reduce your premiums it can be a vital device that can in some circumstances make a difference to someone who is having a bad day. It is up to businesses to decide whether to have AEDs on their business premises or not, AEDs can make a significant difference to a casualties survival if an AED is used within the first 3 minutes, for every minute wasted this drops by an average of 7% – 10% according to UK Resuscitation Council guidelines. An AED requires no maintenance they run self diagnostics and batteries last between 3-5 years on average if the unit has not been used, other than changing batteries when required and replenishing pads and sundries as required then that’s all the units require. All of our workplace first aid courses include using an AED as standard, we also run specialist course “Responding to Incidents with an AED” as a standalone option too.